This technique is done by creating a .diagcab file using Windows Troubleshooting Pack Designer tool that is supposed to be included in the Windows SDK. I installed the Windows 10 SDK, but I did not find TSPDesigner.exe. After reading this blogpost about the bypass I assume that you need Windows 7 SDK to get this tool. This technique also requires a code signing certificate to work. I did not test this technique, but I will revisit this when I get my hands on a code signing certificate and figure out how to create a .diagcab file. If you are reading this and you got a ready made .diagcab file that can be used to test this bypass technique, please reach out to me. Conclusion is that I don’t know yet if this is valid or not. This technique executes hta files using the mshta.exe binary file. objShell.Run "powershell -noP -sta -w 1 -enc <BASE64 ENCODED EMPIRE STAGER>"
As you might suspect, since I am launching PowerShell as my payload, it will get blocked by the fact that AppLocker applies constrained language mode in PowerShell. And that is the results of this test. Basically all I did was to wrap html code around StarFighter.vbs, change the encoded payload with the one generate from my Empire installation and saved the file as .hta. On my test machine this gave me an Empire agent running. 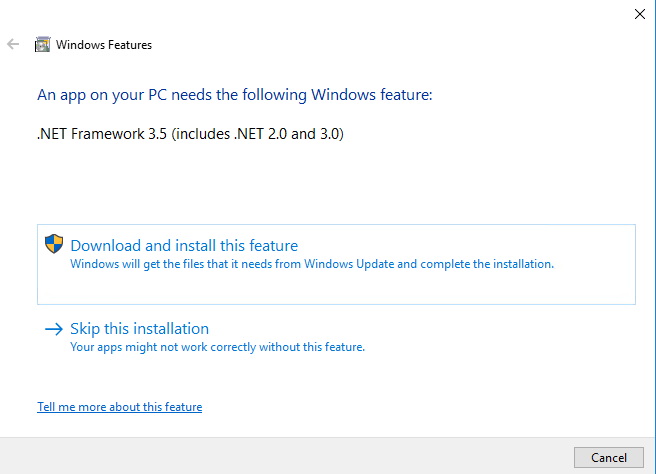 The only caveat is that it requires .NET framework 3.5 feature to be enabled to work (This was enabled on my test machine). This technique executes code in cmd based on input from a text file. For this I have created an Empire batch stager. This Empire stager was saved as Technique10.bat and I also created a copy of this batch file and called it Technique10.txt. I ran the command and it seemed that it executed. This indicates that to bypasses the .bat execution you can do it like this, but the payload (Empire stager) was stopped by the fact that PowerShell runs in constrained mode. This test was to see if I can run cbscript using this technique and execute StarFighter.vbs (same as in Technique 9). I was pretty sure it would not work and I was right. Conclusion is that this technique is a valid technique to run batch files, but not as a bypass to run code you are not supposed to. I cannot see the “big danger” with this. 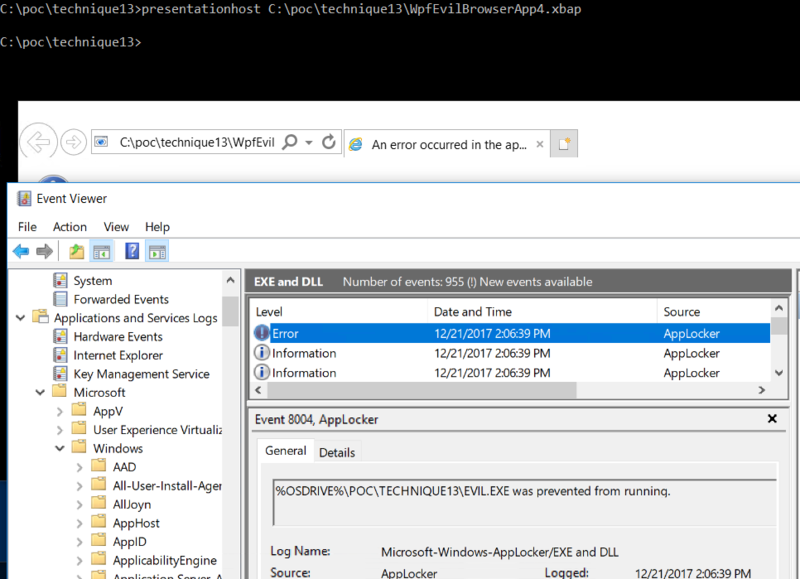 The users still cannot run any other binary files since the AppLocker policy still applies, meaning that evil.exe will still not run even if it is execute from a batch file. This technique will basically be the same as pasting commands into the command window. This technique executes code in PowerShell based on input from a text file. Since AppLocker now applies constrained language mode, any attack using this technique will still get blocked. I have not used a lot of time on this. This is however a method to use if you do not want to paste your script into PowerShell. It also turnes out that AppLocker actually does not block .PS1 files at all any more (change in Windows 10?). This must be a design decision due to constrained language mode. 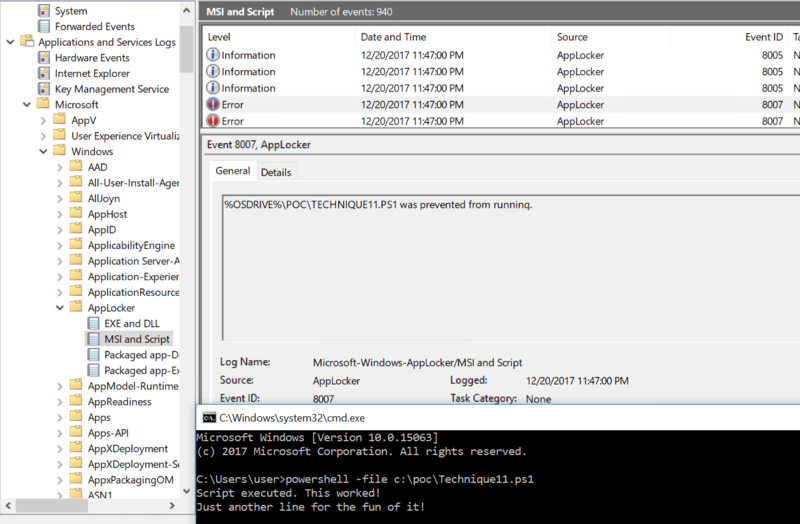 This will tell you in the event log that it is blocked, but the output in the Powershell window tells me that it does not. Conclusion is that this is a valid bypass technique for running PS1 scripts. 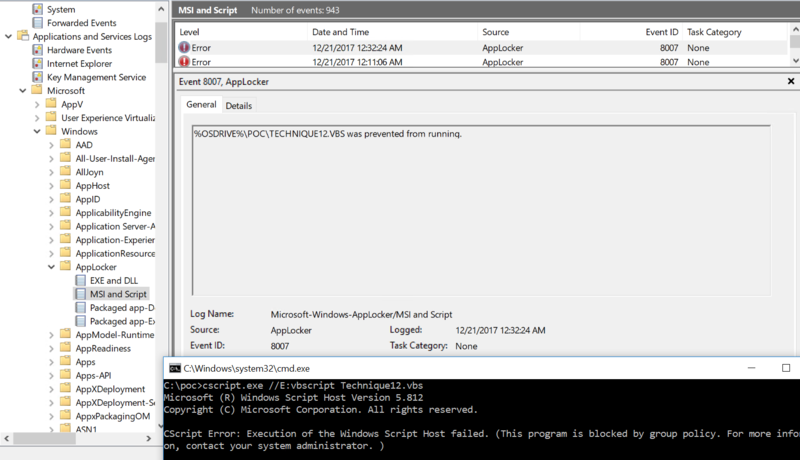 AppLocker is supposed to stop that (unless MS has changed their mind), but this technique is basically the same as pasting the script into the PowerShell window. This technique executes code in vbscript based on input from a text file. For this technique I created a copy of my version of StarFighter.vbs (found in technique 9) and tried to execute. As you can see in the screenshot this was blocked by AppLocker. Conclusion is that this is not a valid bypass in any way. 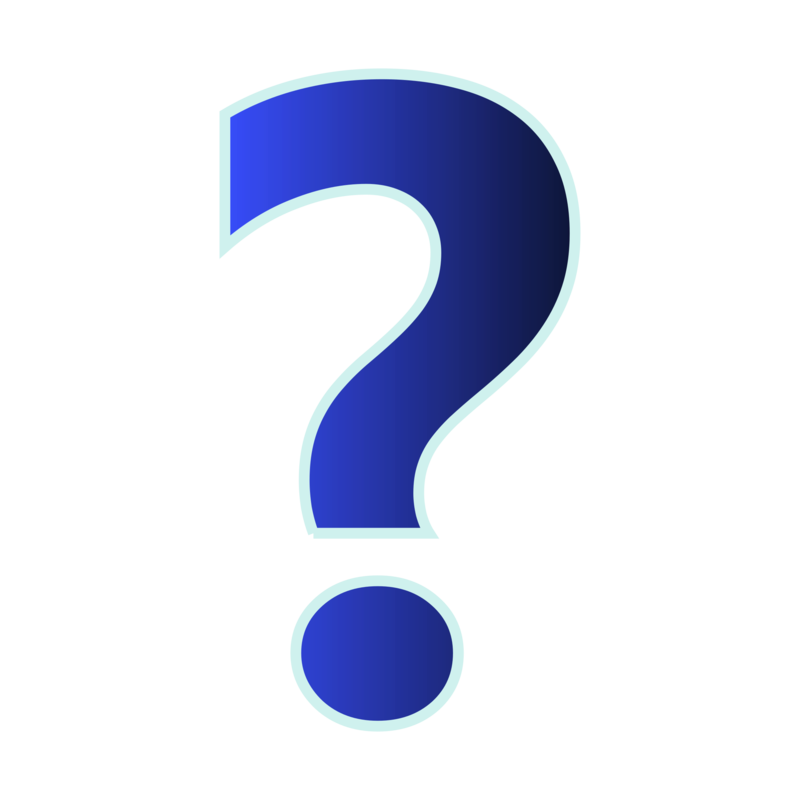 This technique uses something called “Windows Presentation Foundation browser Application” or more commonly known as Xml browser based Applications (XBAP) . In order to use this technique you have to generate a valid WPF application in Visual studio and inject the code you want to run inside it. I was not able to find any good description or guides of this bypass technique. All I found was a PPT from @subtee’s talk at ShmooCon 2015, but this does not go into details on how to create this application as a bypass. The application executes and starts up the main window. I know that it does not make sense to try to execute a .exe file from within C#, but I unfortunately lack some skills in terms of C# coding and I am working on learning it. I will update this post when I have progresses with this. Conclusion is that I have not concluded yet, but to me this seems like a valid attack angle for a bypass. I need more time to create a possible attack using C# code. Hopefully someone will help me a bit on the way after reading this. You’ve mentioned like .ps1 is valid bypass. But in the summary you’ve kept cross mark. It is not a valid bypass, since constrained language mode is applied. But it works as a method for running PowerShell scripts without typing it.